This first one below is my favorite of all the pictures. 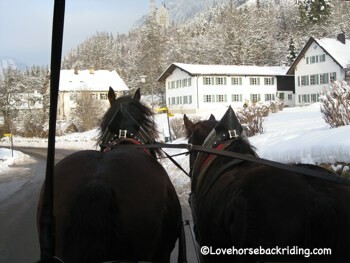 This was taken in Germany, where this team of horses takes visitors up and down from visiting the Neuschwanstein Castle. At the bottom while waiting for visitors, the driver had old fashioned wool blankets thrown over the horse's rumps to keep them from getting chilled in the freezing February cold. 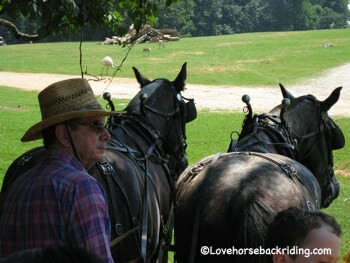 Here is a team of draft horses being taught to drive from the ground. This picture is from a natural horse conference. 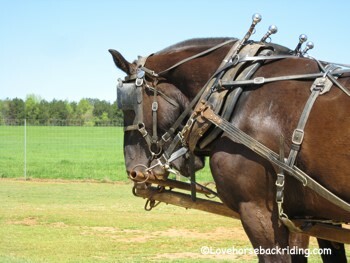 Driving a horse from the ground is a great way to teach them to become confident with activity behind them. This is not easy for them because of the way they see. There is a blind spot directly behind their tail. 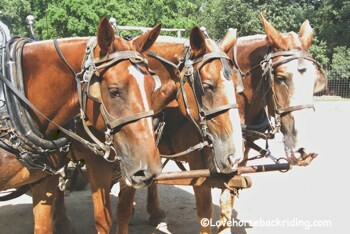 Here is another team of draft horses ready to pull a large wagon of visitors at a drive through wildlife park. 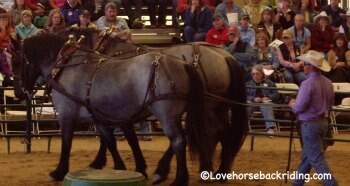 In almost all these pictures you will see that these draft horses have blinders or "blinkers" on. This keeps them from using their peripheral (side) vision. It is thought that they are less spooky this way. Natural trainers may leave this piece of equipment off by preparing the draft team thoroughly beforehand with the many situations they many encounter. This is also one of my favorite pictures. It is not as often that you see more than one or two harnessed together, except on TV westerns and in parades. These three make a great trio! They are even matching colors! Want to see more? Go here.